Select Categories for Conversion such as Contacts, Calendars, Mail, etc. Microsoft Exchange to Office 365 Exporter is a well-designed application. It allows users to move emails along with other crucial items of Exchange mailbox to Office 365 account. This process can be done in a very quick manner with this utility. It can even perform migration of multiple mailboxes. Some users want to migrate only the selective emails. For them, the software brings a useful feature of Date Filter. 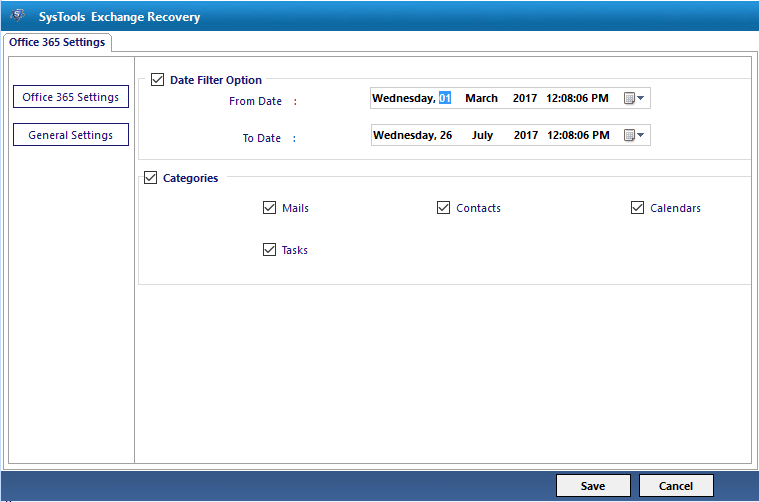 With this, users can choose the emails falling under specific date range. They just put the dates in the column “From” and “To.” After this, it will display the emails falling within that date range to perform EDB to Office 365 migration. The tool makes the entire procedure to transfer EDB to Office 365. It has the ability to export only the selective items from the mailbox such as Emails, Contacts, Calendars, etc. They need to mark in front of the required items from the Folder List option. Once it is done, only those items will be moved to Office 365 account. 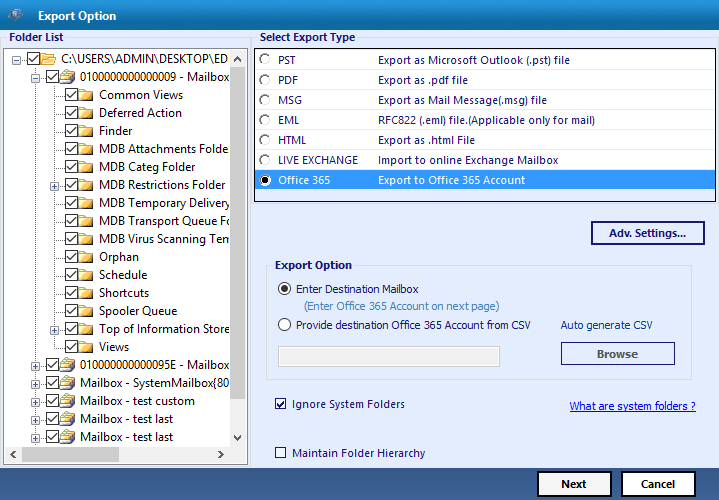 EDB to Office 365 migration tool permits users to view the Exchange mailbox items before migration. They can view emails along with the attachments, events, notes, contacts, etc. The software has an incredible functionality making it possible for user to perform the task in as easy manner as possible that to be accurate. By this software, users can move the files from Exchange to Office 365, after providing the credentials of Office 365 account. They need to put the log ID and Password and then the tool will validate it. After this process, users can proceed to migration process by clicking on Export button. 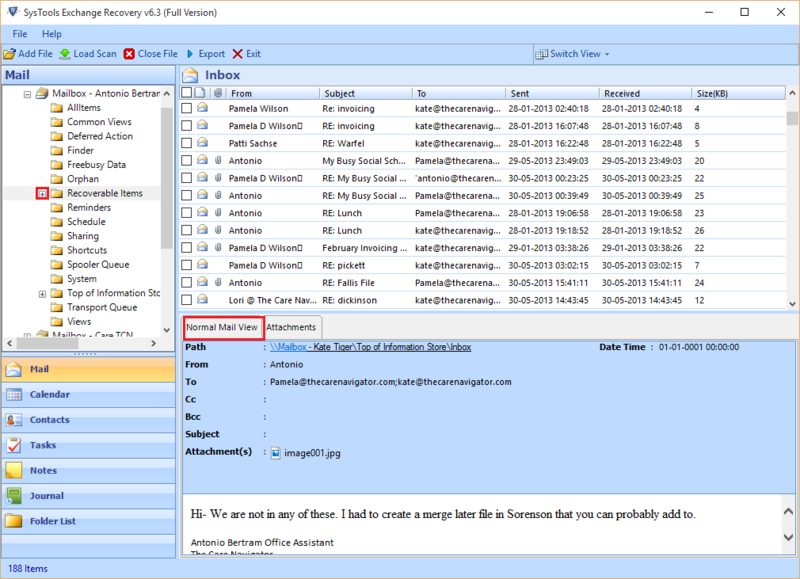 Another added feature in this utility, is the option to create CSV file in an automatic way. In this CSV file, users can put the credentials of multiple accounts in which they want to migrate EDB files. After this, they can load it in the software panel from the storage location and proceed to the migration. In some situations, users do not know the location of EDB files. Therefore, with the help of this Exchange Migration to Office 365 utility, it is possible to locate the EDB files automatically. Users can use auto search option, and all the available EDB files will be displayed on the panel of tool. Moreover, users can search it with search from all drives or specific drive, any of the options. Apart from all the useful features, maintain folder hierarchy is another interesting feature. This is an optional option and once it is selected, Exchange 2007 mailbox to Office 365 software will maintain the hierarchy of the folder throughout the entire process. In addition, it keeps Meta properties intact and can move public and private folders easily. Firstly, you need to launch the tool in your machine. Then, you need to add the file, which you want to export to Office 365 account. 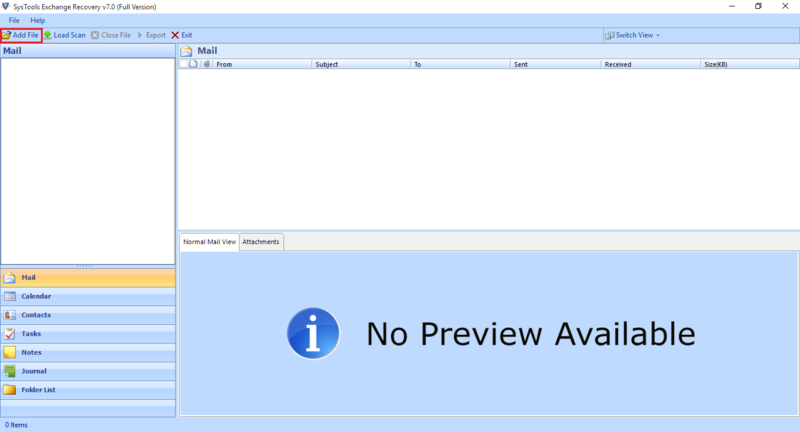 There will be a preview of all emails and other data of EDB file. After this, you need to click on Export. Then, choose Export type as Office 365. You may use the option of impersonation, if you do have the credentials of Office 365 admin account. Using Date Filter option of Exchange to Office 365 Tool, you can migrate selective emails date wise. Now, in the next step, you need to enter destination mailbox and then choose Next option. You can, also use the option of Auto-Generate CSV option. 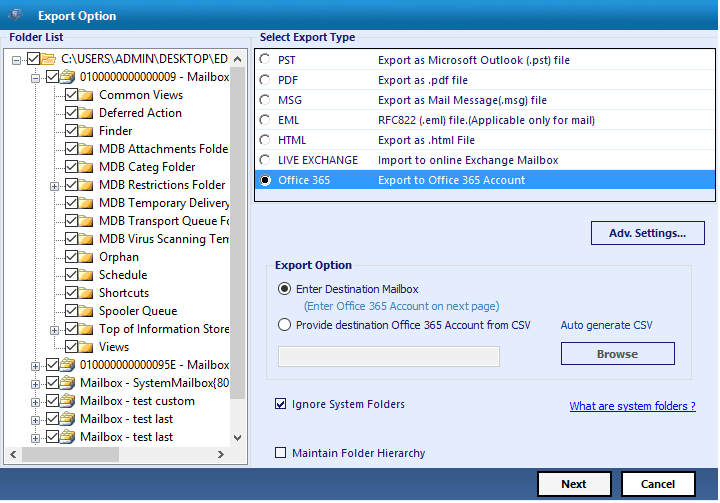 With this, you can add multiple Office 365 account and import Exchange mailbox in them. If you have used the impersonation, then you do not need to password. However, Username is still necessary to initiate the process of export. Download the free version of Exchange to O365 Migration Software to know the working and functionality application. Does Exchange to Office 365 Tool convert multiple files at once? Yes, the software can perform the process of export in bulk very easily. 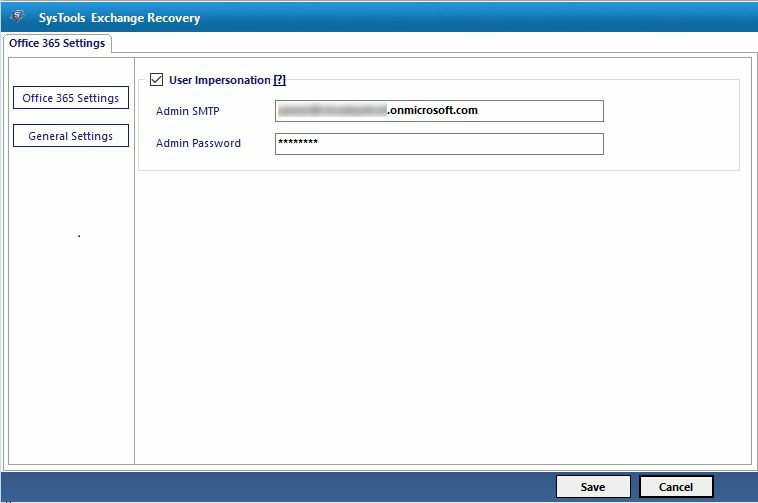 Is it possible to migrate the corrupted/damaged EDB files of exchange server 2010 to Office 365? 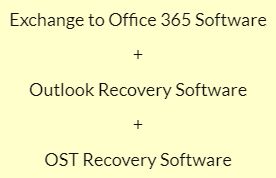 Yes, the tool first repairs the file and then, migrate EDB to Office 365 user account. 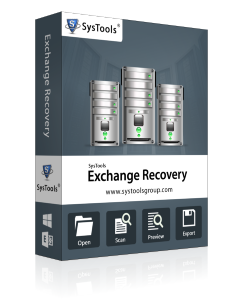 Besides, it supports all versions of Exchange Server. Can I export only selective emails with the help of this utility? Yes, EDB to Office 365 Migration Software brings forth an option of Date Filter for choosing only the required mail. Does the tool is capable to transfer selective categories as well? Yes, you can choose any of the categories like Mails, Contacts, etc. as per the need. Can I run this application on Mac Operating System as well? No, EDB to Office 365 Tool is Windows based program, therefore cannot be accessed in Mac OS X. Is it necessary to put the credentials of Office 365 account? Yes, the tool requires the log in ID and Password to perform the migration process. Exchange to Office 365 Tool is one the useful and amazing utility I have ever used. Initially, I was worried about the safety my data. However, later I realized that it not only keeps the data safe, but also maintains the folder structure. I just liked the tool very much. 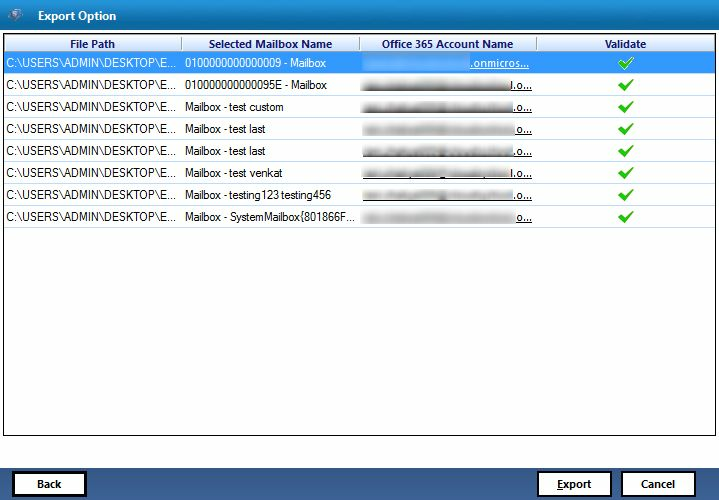 How to migrate Exchange 2013 mailbox to Office 365 was one of my biggest concerns. I searched many manual solutions, but none of them was useful for me. Then, I got this utility and I thought to use it once. Now, I can say that I was fortunate that I found this tool as with this I have completed my task in almost no time. My experience was really great! An impeccable utility to work with! Yes, my first experience with this tool is very good. The best thing about this tool is the way it has been designed and import EDB to Office 365. The interface of this software is very easy that even a novice can handle it properly. EDB to Office 365 helped me a lot in migrating the EDB files to Office 365 account in batch mode. It comes up with so many useful features that make the entire process very quick and smooth. I want to say a big thank you to the complete team of developers for a such an advance tool.